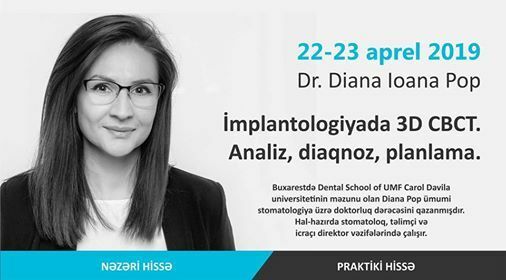 Praktiki kurs üçün bütün iştirakçılar öz notbukları ilə kursa gəlmələri vacibdir. Kurs ümumilikdə 4 saat davam edəcək. Qruplarda yerlərin sayı məhduddur. İştirak üçün ödəniş - 40 AZN. Bütün iştirakçılara sertifikat təqdim edilir. Ünvan: VİTTA şirkətinin tədris mərkəzi. A correct positioning of the implant, which allows an ideal final restoration, is always desirable for clinicians, whether it is a single crown, a one-piece prosthesis attached to the implant, or a surgeon on implants. To achieve a successful outcome, an in-depth analysis of residual crest anatomy and bone density assessment is required. Typically, two-dimensional radiographic images - retro-alveolar and panoramic - were used to view the interested area. Despite the increased resolution of 2D images, the main disadvantage is that the vestibular-lingual width of the alveolar bone cannot be accurately assessed, which can lead to implant positioning errors and a compromised end result. CBCT technology provides a precise assessment of alveolar crest, determining the exact height, width and anatomy of the alveolar crest, as well as the relationship between the edentation and the adjacent anatomical structures (sinuses, nerve etc). Implant placement can be done easily with 3D CBCT data, and the clinician can also determine if pre-prosthetic surgery, such as bone addition or sinus lift, is required before placing the implant.